In 1947 Messrs Faber published Holbrook Jackson's edition of The Complete Nonsense of Edward Lear - cloth binding blocked with a wild design by Barnett Freedman. However, it admitted to being only a reprint of texts published up to 1895 and thus by no means 'complete', and Faber's recent paperback reprint is even less so. (They'd better watch out for the Trade Descriptions Police.) The completeness of Noakes's giant volume is a different matter altogether. She is the world's leading authority on Lear, having published a biography and a Selected Letters, and having organised the superb eggzibission at the Royal Academy in 1985. Now, in this gromfibberous cornucopia, she sets out a chronological sequence of everything (apart from some repetitious alphabets) that can pass as, or that is adjunct to, Learical lyricism. She begins with the extraordinarily precocious 'Eclogue' that the thirteen-year-old Lear wrote when he and his family had to leave their Highgate home for London: The rural scene to change for houses, brown, And barter health for the thick smoke of town. and she carries us through all the 'official' published nonsenses, with eggstrax from letters and diaries and from whatever random sources she has found interspersed among the familiar texts. Recognising too the importance of Lear's drawings as an essential element in his tragi-comic world she has given us excellently reproduced examples of everything needful, including - hurrah! - eighteen of his Absurd Birds in colour. (These instantly reveal the tradition that connects Lear to Quentin Blake.) The colour plates also include one or two examples of Lear's hand-coloured lithographs and paintings which relate back to Vivien Noakes's biographical introduction and the extensive and very helpful chronological table that accompanies it. These are balanced at the end of the book by indexes, by 84 pages of notes, and by some examples of the poet's nonsense similes. Such editorial exposition is not mere scene-setting or bibliographical substantiation. 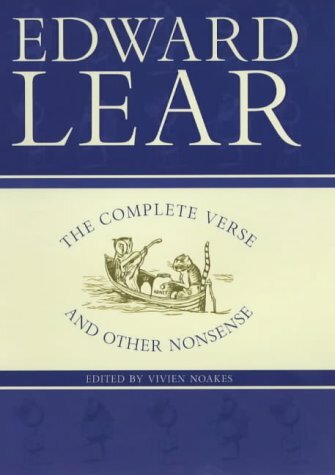 It serves primarily to highlight the uniqueness of Lear's genius - the creative contradictions of his 'hurried, boshy life': the ludicrous transformed with elegant craft into threnody, the apparently slapdash caricatures subsisting alongside works of painterly skill, the conviviality masking a life of heroic loneliness. He would have been deeply moved (and probably embarrassed) at this triumphant celebration of what he once dismissively called his 'volumes of stuff'. O, quacks vobiscum - what a lark!